I've had this wonderful looking Magic Custard Cake recipe on my todo list ever since White on Rice Couple blogged about it. I mean, how can you resist something called Magic Custard Cake? It sounded so interesting, a batter that separates into a top fluffy cake layer and a middle custard textured layer. I finally got around to trying the recipe this weekend, but with the added twist of flavouring it with matcha. I looooove anything green tea flavoured and I had a severe hankering for a green tea dessert this weekend. And since I totally chickened/lazied out of my original plan to try making one of those nutso matcha crepe layer cakes, this was the next best option. 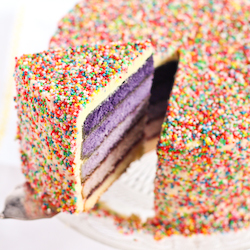 Not going to lie, there is definitely something magical about this cake recipe. I had my doubts as I was making it because the method is quite unusual, but I followed the instructions closely and made sure all my ingredients were at the right temperature and it turned out just like I hoped. A lovely soft and cakey top layer, with a wobbly, custard-like layer underneath. And with a good, strong flavour of matcha. I like my matcha strong so if you decide to try this version you are welcome to adjust the amount of tea powder to your taste. As the original recipe recommends, it's important all your ingredients is at the right temperatures when you add them too the batter, especially the milk. 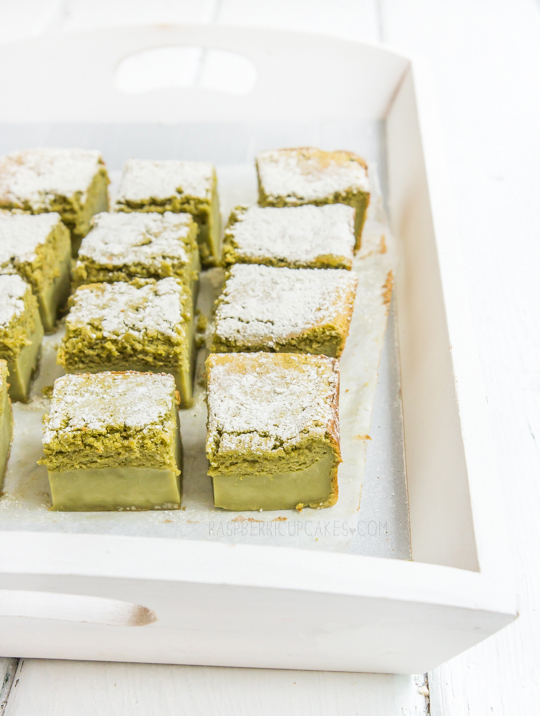 I think the matcha flavour works particularly well with this dessert; the slightly chewy bottom layer almost reminds me of mochi so the whole thing seems very well matched. Ummm how cute is the new addition to my teacup & saucer collection? Thanks Karen! She knows the way to my heart. My teacup collections is getting a little out of control. 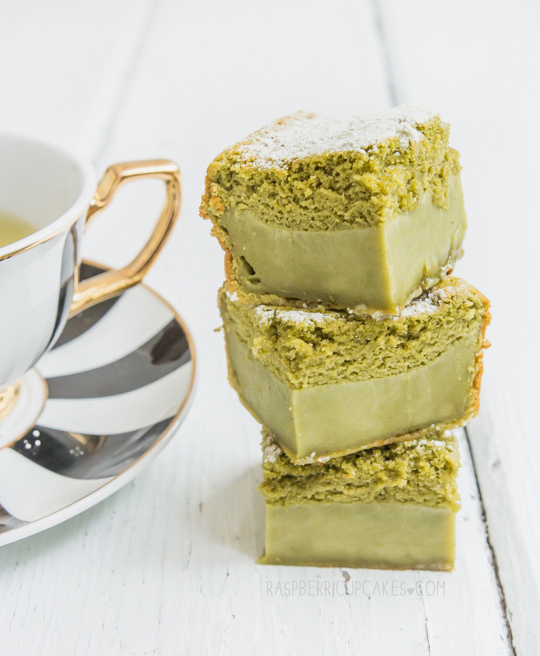 This dessert might not be for everyone, I know some of my friends who aren't familar with green tea desserts were a little unsure of it. The original recipe and the chocolate version would probably be more up their alley. But as a matcha lover, I couldn't get enough of it. It's a perfect afternoon treat to be enjoyed with a cup of tea. Preheat the oven to 160°C(325°F). Grease and line a 20cm (8 inch) square baking pan/dish with baking paper. 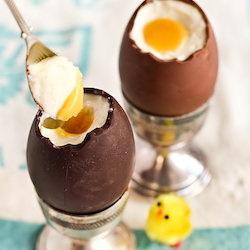 In a large mixing bowl, whip the egg whites and vinegar to stiff peaks with an electric mixer. Set aside. In a separate large mixing bowl beat the egg yolks and sugar until light with an electric mixer. Mix in the melted butter and the tablespoon of water for about 2 minutes or until evenly incorporated. Using a hand whisk, mix in the flour until evenly incorporated. Slowly hand whisk in the milk and until everything is well mixed. Fold in the egg whites with your hand whisk, 1/3 at a time. Repeat until all of the egg whites are folded in. The egg whites will appear curdled and lumpy at first but keep gently mixing with your whisk until all the larger lumps are incorporated. Pour the batter into the prepared pan and bake for 40-50 minutes or until the top is golden. (Take care not to overbake, middle should still be a bit wobbly) Allow cake to completely cool (you can place it in the fridge after 15 minutes to cool it quicker) before cutting and then dust with icing sugar/matcha mixture. Can be stored in an air-tight container in the fridge for several days, best served at room temperature. These look Delicious! I am loving the colour and anything with match a has my name on it. I been experimenting with custard cake recipes too; I can wait to give it ago! 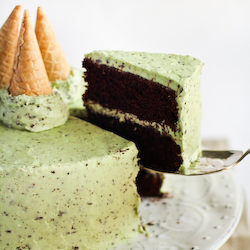 i love matcha to the moon and back, i was going to do a matcha crepe cake too but this may have just been prioritised! 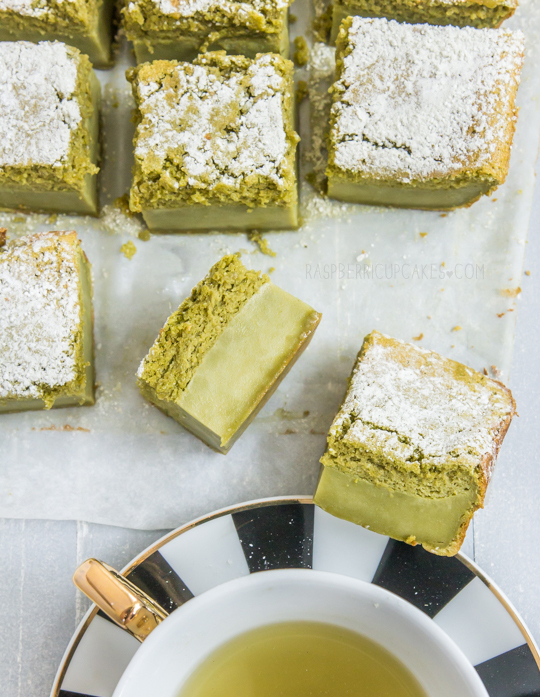 I'm missing the abundance of green tea desserts that I saw in Japan so I might just have to make this to satisfy my matcha dessert craving! I love this idea!! Green tea flavored anything is the way to go!! These sound sweet and refreshing. Gorgeous colour too! This is so cool! Love matcha-aaa desserts! Is there a reason why vinegar is used though? I believe it's to stabilise the egg whites, there's a note about it in the original post I linked to! This looks and sounds magical indeed; I'm intrigued by how it happens. 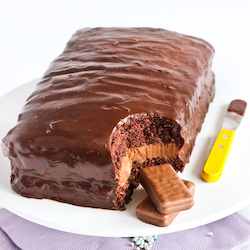 I'm definitely going to make this. 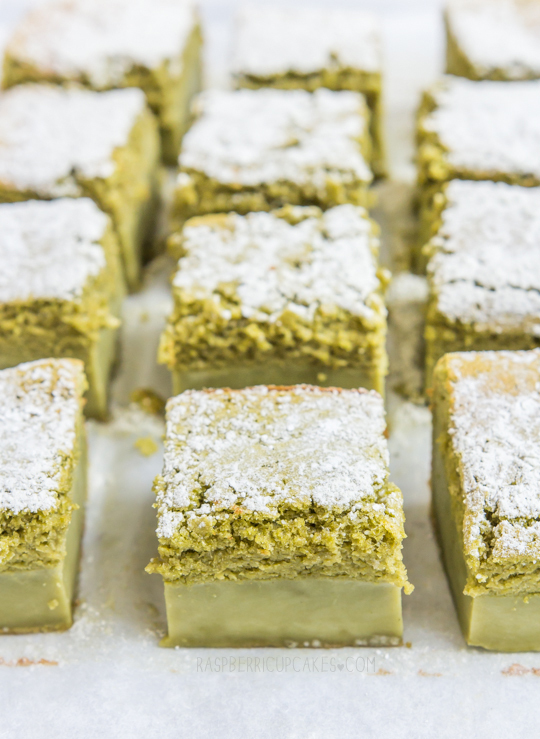 I need more matcha desserts in my life too. 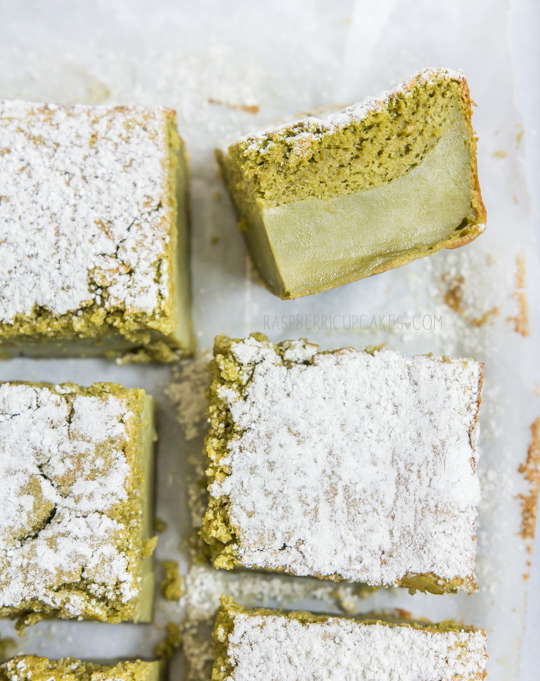 I've been meaning to make this cake for ages but I love how you made a matcha version of it! Looks incredible! Got so excited when I saw this and had to make it! I added vanila bean and lemon rind to mine instead though :) it's in the oven and one half of it had risen up like a volcano trying to erupt while the other side looks lightly puffed. ..any thoughts?? Hmm you might have just had a few too many big air bubbles still in your cake batter, I would just poke a hole in the rising part with a skewer and rotate the cake around so it cooks evenly? Sorry I didn't reply sooner! It went back down as soon as I pulled it out the oven :) so no lopsided cake yay! Although my cake layer was definitely not as think as yours but think it might be due the fact my pan was bigger? yum! 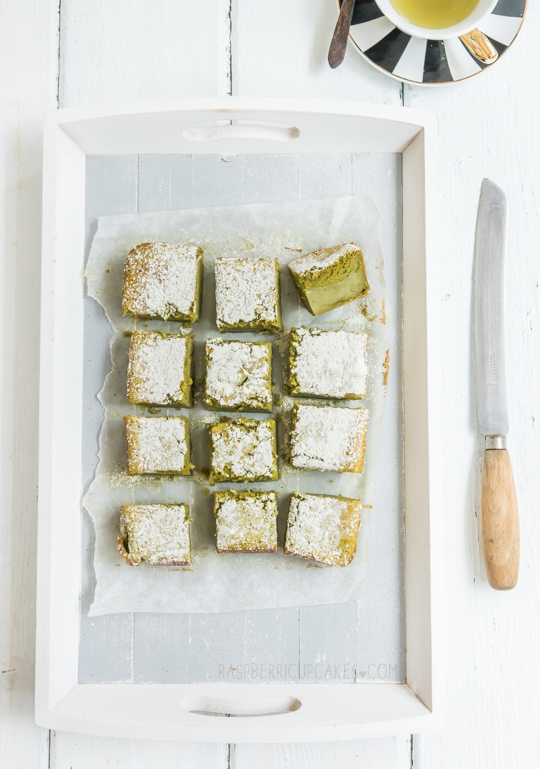 I've made the vanilla version of this...can't wait to make a matcha one! Hi Leanne, I wouldn't set it too low, but it really depends on your oven. My oven is fan forced and runs quite warm but I think I still had it set to around 155 degrees. 4 drops is...4 drops? Like with an eye dropper? Maybe about 2ml? MY MOM AND I JUST MADE THIS AND OMG! FRESH OUT THE OVEN AND I'VE ALREADY DEVOURED HALF!!!! THIS IS HEAVENLY. 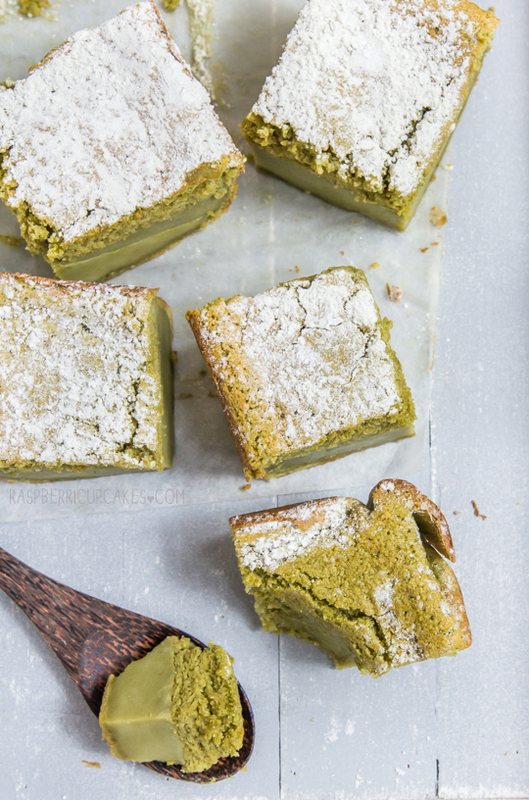 CAN'T WAIT TO TRY THE COOL DOWNED MATCHA CUSTARD CAKE. THANK YOU FOR THIS BEAAAAAUTIFUL, MAGICAL RECIPE. FAVOURITE BLOG!